Figures from Eurostat confirm initial estimates in February that the eurozone economy shrank by 0.6 per cent in Q4 of 2012 with the EU shrinking by 0.5 per cent. THE EUROZONE SUNK further into recession in the last three months of 2012 as the debt crisis continued to exact a heavy price according to new data released today. The eurozone economy shrank 0.6 per cent in the fourth quarter of 2012 compared with the third quarter when it contracted 0.1 per cent, the Eurostat data agency said, confirming initial estimates given in February. For the full 27-member European Union, the economy was 0.5 per cent smaller in the fourth quarter after a marginal gain of 0.1 per cent in the third, Eurostat said. A recession is counted as two consecutive quarterly economic contractions. Compared with fourth quarter 2011, the eurozone economy was down 0.9 per cent and the EU bloc of 27 off 0.6 per cent. Among the major economies, European powerhouse Germany shrank 0.6 per cent in the fourth quarter after a gain of 0.2 percent in the third and France slipped 0.3 per cent after growth of 0.1 per cent. There was no data supplied for Ireland which will not confirm its fourth quarter figures until the end of this month. Non-euro Britain lost 0.3 per cent after sharp growth of 1.0 percent in the third quarter, boosted by the London Olympics. Among the fourth quarter best performers were Estonia, which grew 0.9 percent and Lithuania, up 0.7 percent, while bailed-out Portugal was the weakest, with its economy shrinking 1.8 percent. 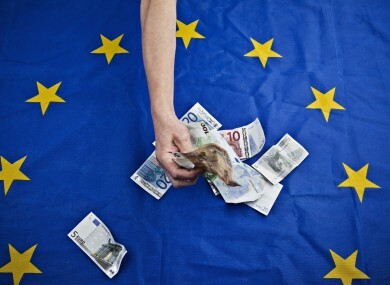 Eurostat said that for 2012 as a whole, the eurozone economy contracted 0.6 percent and the EU 0.3 percent. Data so far for 2013 suggests the European economy is stabilising after a very bad 2012 but the outlook remains weak and uncertain. Email “Eurozone sinks further into recession in last quarter of 2012 ”. Feedback on “Eurozone sinks further into recession in last quarter of 2012 ”.